The National Park of Guadeloupe with its mascot, the "Ti-Racoon", provides around 300km of marked trails - socalled "traces" - in the mountains of Basse-Terre. They lead you into the center of one of the most beautiful rain forests of the Lesser Antilles, where you can explore the world of tropical animals and plants. There are also various possibilities for excursions on Grande-Terre like hiking through the Mangrove or along the cliffs of the Atlantic coast. You should take several precautions while hiking through tropical areas: since there is always the chance of a severe rain shower, you should bring warm rain protection (even in the mountains of Guadeloupe it can be cold!) as well as waterproof hiking shoes. Water for drinking and sun protection are a must. And don't forget, that the night begins just after sunset at about 5.30 and 6.30 pm ! Short, flat trail (2 minutes) from the Route de la Traversée to a waterfall, which falls into a round basin, where once you could find crayfish. The water then runs into the Corossol river; nice place for swimming and picnic. Three easy trails (20 minutes to 1:30 hours), which run around the House of the Forest along the Route de la Traversée; here you can explore the rain forest with its gigantic trees and roots (West Indian hardwood, tropical chestnut trees, ferns and creepers ...). Acces from Capesterre-Belle-Eau, in the village Saint-Sauveur. For security reasons, since 2005 no more access to the basin of the second waterfall cascading down 110m. The trail stops at the bridge from where you can enjoy the view to the falls. Well trained hikers should continue another 4 hours to the first waterfall, where the water runs down first for 115m and then another 15m. For the third waterfall you take the route from Capesterre-Belle-Eau to Routhiers. A hike of medium difficulty of around an hour brings you to the foot of the third (20m). You start from Bain Jaunes, the parking place after Saint-Claude. The last parking: Savane-à-Mulets, is not accessible since landslips in 2005. 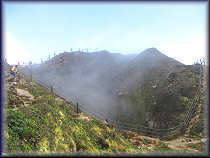 The hike with medium difficulties up to the peak (1.467m) and the crater of the vulcano, which is still active, takes about 3 hours, first through rainforest, then mountain savannah in air full of sulphur. Here you must pay attention to the reflecting marks. If you are lucky, the clouds around the top open up and you can enjoy the incredible view. 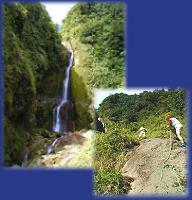 Follow the route to La Soufrière from Saint Claude until the Bains Jaunes. There the trail of medium difficulty, but quite wet, leads downwards through the rain forest, with many tropical flowers. It will take about 1:30 hours (turn) to reach the basin of the falls of about 40m (131ft), the last 10 minutes you'll have to go up a steep slope, guided by ropes fixed to the rock. A refreshing swim in the basin of the waterfall is possible, and back to the Bains Jaunes, you can enjoy the warm sulfur waters of the pool there. Access on the route to Acomat near Pointe-Noire. 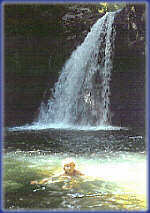 Short, but steep track (15 minutes) to the waterfall which cascades in a beautiful natural pool. Near Vernou in the village Glacière. You descend first through a banana plantation and then through the rain forest to a waterfall in the shape of a halfmoon and with a pebble beach (20 minutes, medium difficulties). You take the road to Anse-Bertrand and Porte d'Enfer. Easy 20 minute walk to eighty meter high cliffs above the breakers. On a clear day you can see the islands of Désirade, Montserrat and Antigua. There are a lot of other hiking tours, some of them very long and difficult. Find here the complete listing of the trails on Basse Terre and their condition and accessibility. You can get more information from the local tourist boards and the National Forest Office (ONF). The "Bureau des Guides de Randonnées Pédestres de la Guadeloupe" (Association of Mountain Guides) organizes guided hiking tours, click here to consult the schedule and sign in!